Installation of Digital Video Surveillance system. Five T's Surveillance is a full service video surveillance company, we will help you decide on the right digital video recorder and cameras for your needs. Weather you have a local area network "LAN" in your facility or you need a network built to have your computers connected to each other Five T's Surveillance can get the job done. Camera adjustment on existing cameras. You have an existing camera system and the cameras need to be adjusted Five T's Surveillance Support is happy to clean and aim your cameras. We know how it happens, you open an email or go to an infected web site and, oh no!, your computer doesn't work correctly. 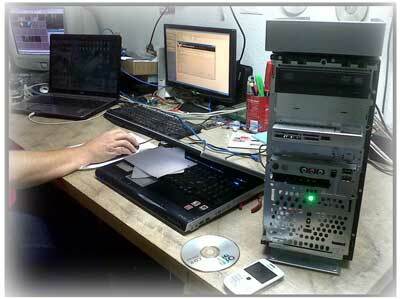 Digital Video Surveillance Systems are not immune from viruses, however they are not often infected. Your surveillance system is dedicated to video recording only, If you don't surf the web or check email on it is far less likely to become infected. When you install computer programs many of them install software in the background that you didn't ask for. We have the knowledge and ability to turn off running software and this will help your computer to run faster. We have several support avenues that allow us to service or repair your computer. 1: Onsite Support, We come to your home or office and repair your computer systems, If we are not able to repair onsite we can take the computer make the repair and deliver the computer back to you. 2: Remote Support, we have the ability to remote access your computer, with your permission. We have you go to a web site enter your name and a numeric key and click OK and were fixing you computer for you and you didn't have to pack it across town. We can train you, If you had a system installed and were not trained or have forgotten how to use it Five T's Surveillance can help. We have a full knowledge of embedded DVR's, PC based systems and if we haven't used your type of DVR system we ca acquire an user manual from the DVR manufacture and configure it to best suit your needs. When you are connected to the internet your Internet Service Provider gave you an IP address, IP address change randomly "we have seen an IP address change up to 100 times per day" that means that when you need to connect to your video surveillance system you wont be able to because your IP address has changed. Five T's Surveillance has a system setup to track your IP address and convert it to a name that fits with your company, Your remote access is ready when you are.